Looking to get away to Six Flags Fiesta Texas, Sea World or stay in a hotel near The Shops at La Cantera? 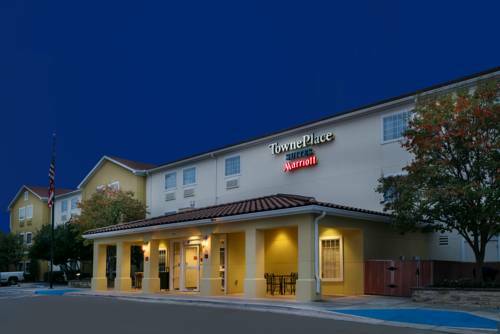 Look no further for a Northwest San Antonio hotel than the TownePlace Suites San Antonio Northwest. Our extended stay hotel is also in close proximity to KCI, West Corp, Randolph AFB, Valero Energy, MedTronics, Chesapeake Energy, the FBI, and many more. Our hotel is located near the prestigious University of Texas-San Antonio (UTSA) and St. Marys University. Guests will enjoy complimentary hot breakfast served daily, free Wi-Fi, comfortable beds with plush Marriott bedding, fully equipped kitchens along with a gym and pool access. Enjoy a hassle free commute with our complimentary shuttle service anywhere within a 3-mile radius. Traveling with Fido? Were a pet-friendly San Antonio hotel as well. Enjoy your short or extended stay at the TownePlace Suites San Antonio Northwest.